Chrome plated to prevent normal wear and tear to help owners enjoy their cars longer without the nasty need for replacements. 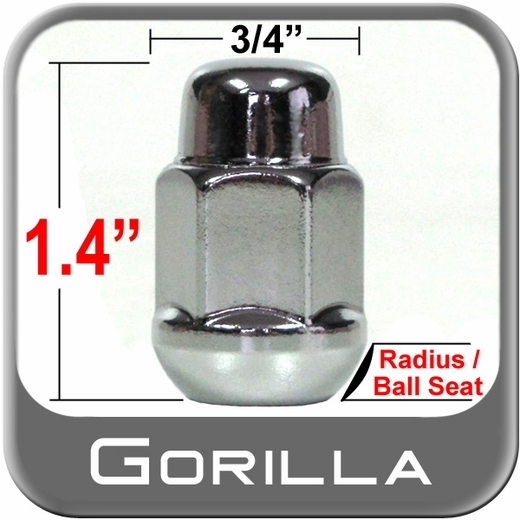 Every chrome lug nut is shaped from steel of the highest degree. Precision Gorilla engineered seating capable of fitting any make and model with a ball seat application. I wanted to dress up the steelies on my Honda Fit, and lug nuts were going to be a part of this conversion. I had ordered a set from another 'unnamed' company that assured these would work on my Fit, but instead of a ball seat used by Honda, the lugs were a 'taper' seat. There was a bit of hassle from this other company, as to returning them. They wanted to 'try another set', and I finally just said, 'give me the refund'. I went on the Brandsport site, looked up Gorilla lug nuts for a Honda Fit, and was directed right to what I needed to use. YES ! !, they had the 'ball seat'. Got the lugs in a very reasonable amount of time, finished up the steelies with paint/ old style Honda center caps, and stainless trim rings..the Gorilla lugs look GREAT in the whole picture...Thanks, Brandsports ! !